Experience Easter like never before! The ancient story still has power and life today. Because of the empty tomb we can live life in the light. 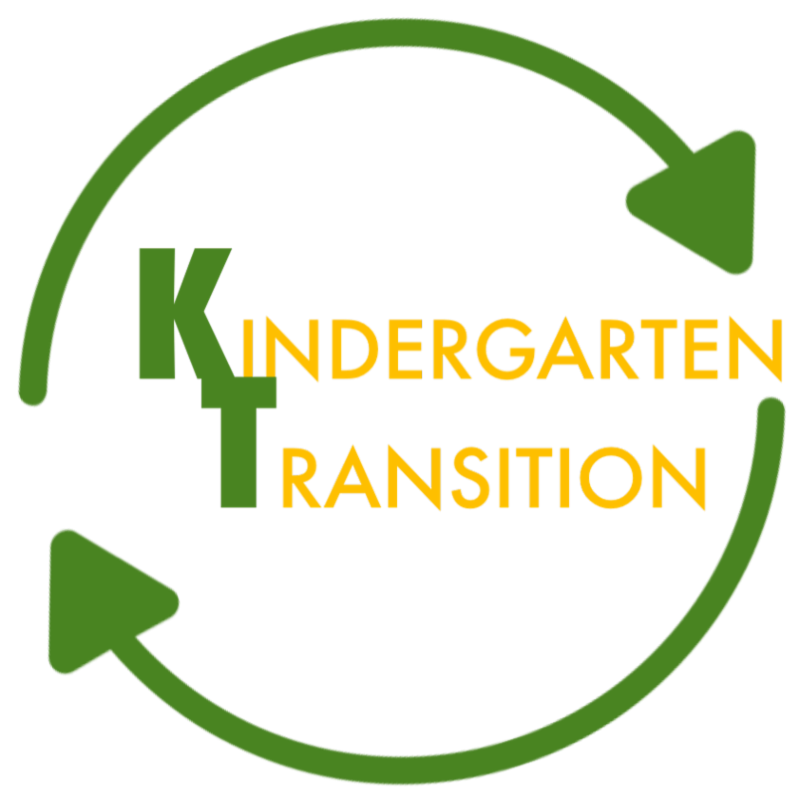 There will be great kids programming available for birth through 5th grade. Invite someone to join you for worship at 9 am or 10:45 am! 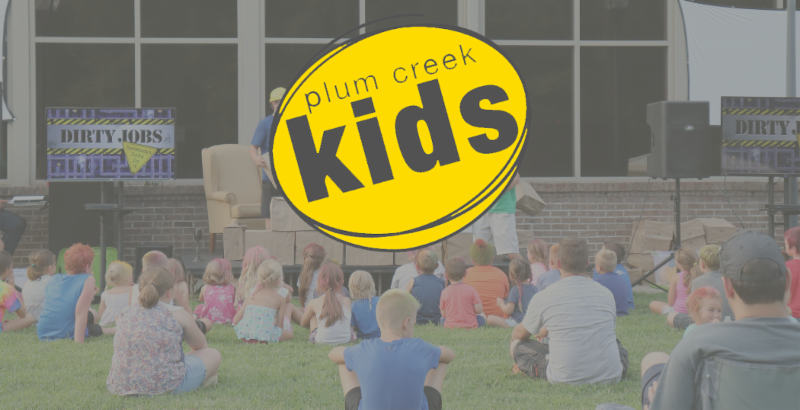 Have questions about Plum Creek? Want to know how you can get involved? Want to make this place a little smaller? 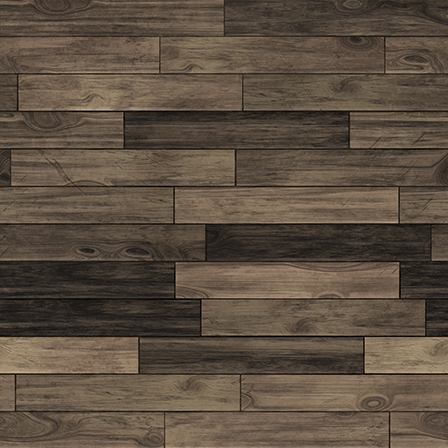 who Plum Creek is, what we're about, what you can expect from Plum Creek, and what Plum Creek expects from you. We also take time to answer specific questions you might have . 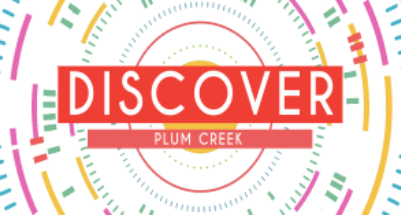 Come join us to discover Plum Creek! A free meal & child care is provided. 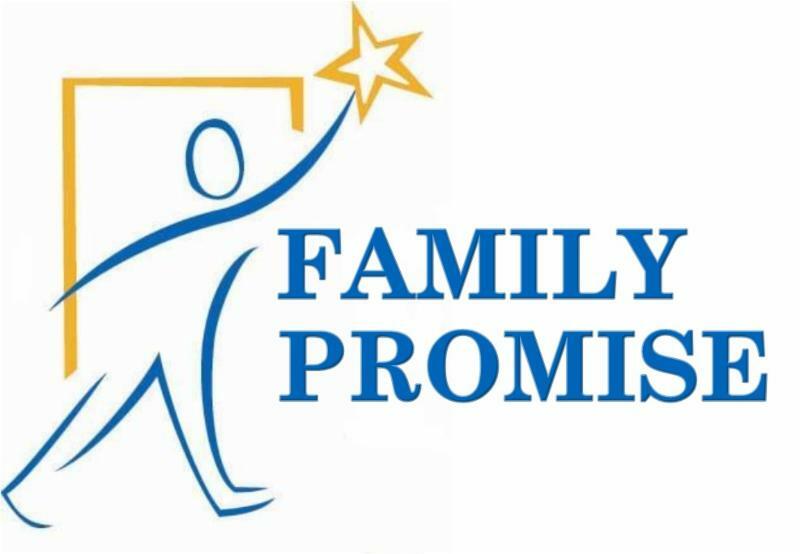 If you would like to participate during our host week with Family Promise, please contact Susan Prather (859.991.0516) OR Ed Prather (859.462.2061). Serving opportunities are still available for van drivers & overnight hosts! 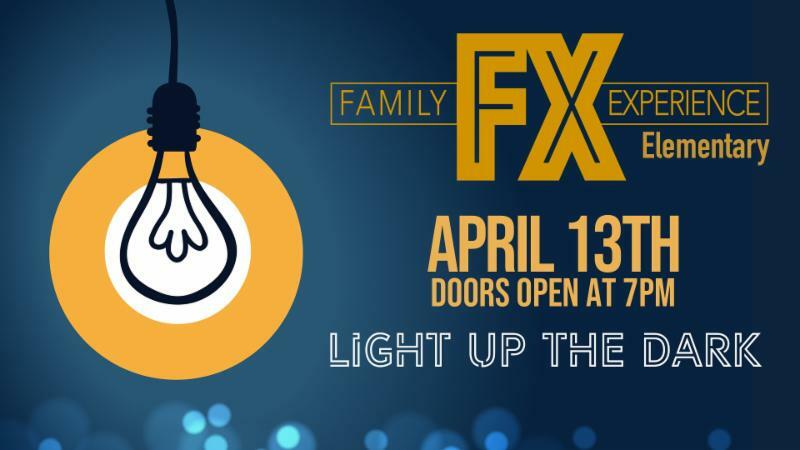 ELEMENTARY FAMILIES: Come celebrate the amazing story of Jesus' resurrection with your kids on Saturday, April 13th. worship and share the story about the one man that lights up every dark place! Please let us know you'll be there! Click here to Pre-Register Kids! 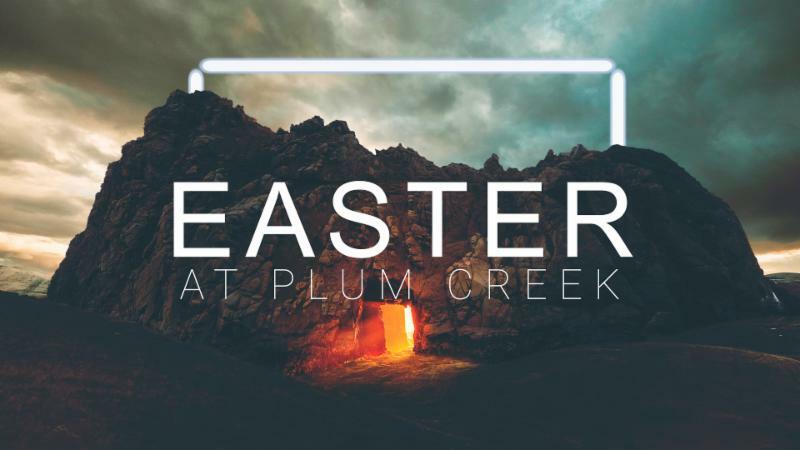 We are so excited to celebrate Easter at Plum Creek, especially with kids! We have an exciting morning of fun, games, singing and discovering about the wonderful message of Jesus' resurrection. We will have full Sunday morning programming for all kids aged birth-5th grade at both 9 am and 10:45am. 11th. And you are invited! Registration forms need to be submitted before May 12th. If you knew your time on Earth was coming to an end, what would you want to say to the people in your life? For Jesus, the days leading up to His death were filled with meaningful conversations with the people around Him. In this series, as we look at some of His famous last words, we'll discover what Jesus really wanted His followers - both then and now - to know. 14 God's grace is unfairly good. RISEN EXPERIENCE . 100 Student Goal! 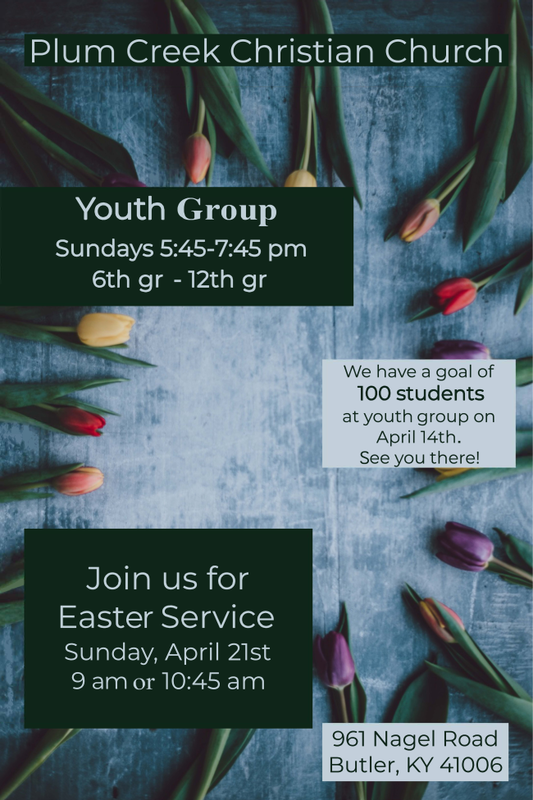 Easter is right around the corner and this year we have a BIG GOAL of 100 people at youth group on SUNDAY, APRIL 14th from 5:45-7:45pm! We can’t do this without students inviting friends. And we heard there is pizza involved for the winners!! Youth Group is for all students 6th-12th grade. We have snacks, games, time with friends, a lesson and small group time to grow your faith and build community with those around you. Not yet a part of youth group? Join us! The school year is coming to a close and our high school seniors are preparing for graduation. 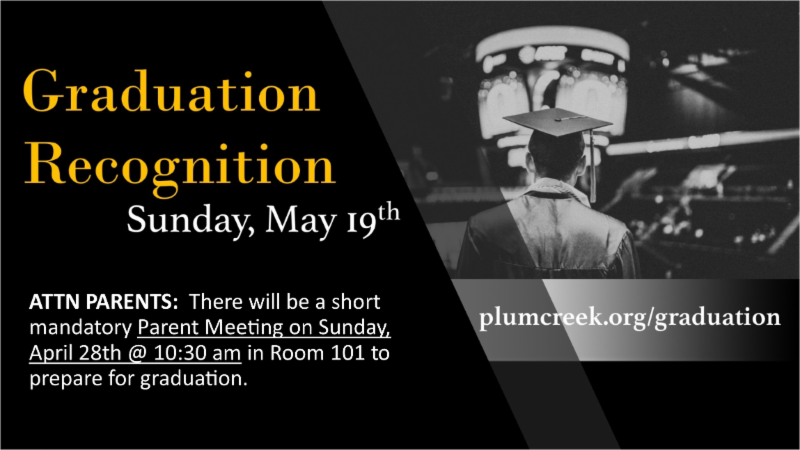 As you are getting ready, would you please add MAY 19TH for our Plum Creek Graduate Recognition on your schedule? We will be having a short recognition during both services and then a lunch for the graduates and immediate family after church. In the four weeks leading up to Easter, we are going through a sermon series called “The Certainty of Eternity.” In the past couple of years, God has really impressed upon me that no matter how long we live, this life is short. James 4:14 says, You are a mist that appears for a little while and then vanishes. Eternity, however, is long. It’s forever long. And no, we shouldn’t let thoughts of eternity keep us from the life that God wants us to live here and now, but we absolutely should live with eternity in mind. So how do we do that? How do we make the most of our very few moments between birth and physical death? Well, first, we have to remember that we were created by God, for God. We exist for His glory, and we’re meant to be in relationship with Him forever. The only way to fulfill that destiny is through a life-changing relationship with Jesus. (John 14:6) Once we’ve established that relationship, we not only have the hope of eternity with God. We also have the Holy Spirit, who enables us to have a positive impact for God’s kingdom right here in this world. And if all of these things are true, we come to a conclusion that only makes sense. If everyone spends eternity somewhere… and the only way to eternal life is through Jesus… and the Holy Spirit is working through us to make an eternal impact in this life… then we know that God will call us to reach out to people who need Jesus. No, we can’t save anyone. Only Jesus can do that. But we can reach out. We can point people to Jesus. If we’re not interested in leading people to a life-changing relationship with Jesus, we have to ask ourselves, do we really believe what the Bible says? Do we really care about people the way we say we do? It’s my conviction that many of us really do believe and we really do care, but we also get intimidated… or discouraged… or distracted… or whatever. So that’s why, between now and Easter, we have a challenge for all of Plum Creek, leaders included. The challenge is to identify at least one person you know who needs Jesus, and invite them to join us for Easter. It’s as simple as that. And you know, you don’t need any special gifts or skills to invite someone. My 6-year-old daughter can do this. So, are you ready? Are you praying for God to put someone on your heart? Are you willing to reach out and help someone find the hope that only comes from Jesus Christ? I’m ready, I’m praying, and I’m willing. Let’s see how God will use us to make a difference for eternity. Ladies! 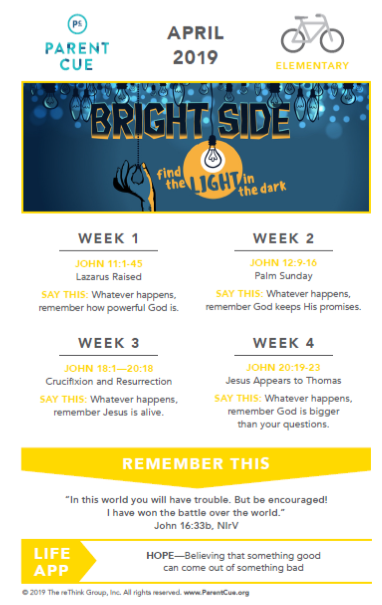 Be on the lookout for upcoming Bible Study opportunities. 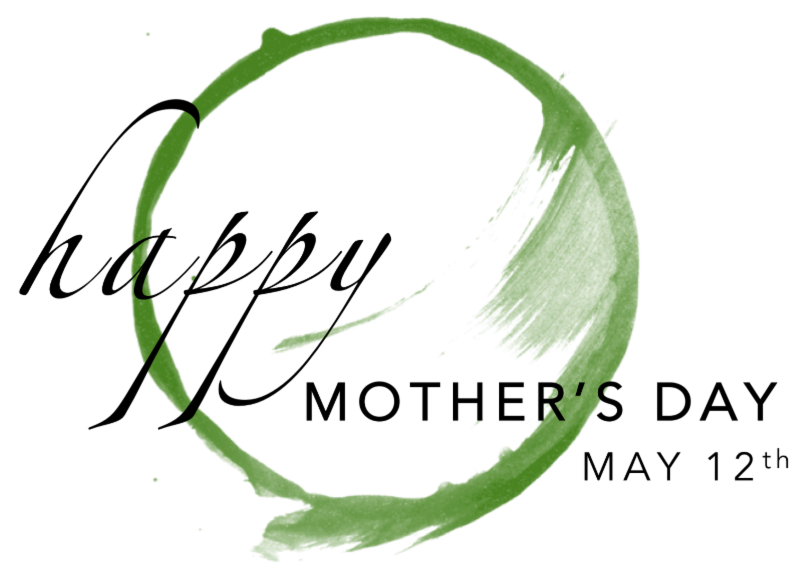 Details will be shared soon via the Plum Creek Women's Facebook page and in future church announcements. Until then, join us in the Word by trying out this Easter Scripture Writing Plan. If you're unable to join us, you are still able to donate to our team. Remember... all donations & registrations come back 100% to our Sharing Center Ministry which helps us feed our neighbors in need. GROUP PIC: Meet the team in front of the Underground Railroad Building on East Freedom Way @ 8:40 am. This is just across the street from where you register. This will give our runners time to be part of the picture and take their place for the start of the race. Join us on May 12 th as we celebrate Mother’s Day.